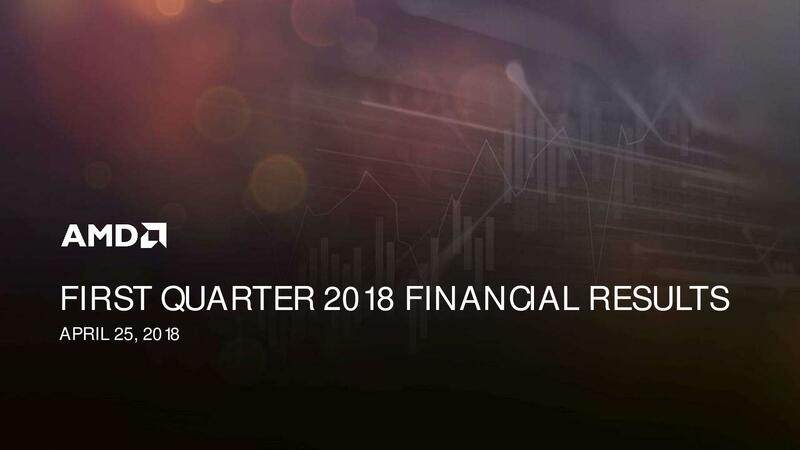 AMD (NASDAQ:AMD) today announced revenue for the first quarter of 2018 of $1.65 billion, operating income of $120 million, net income of $81 million, and diluted earnings per share of $0.08. 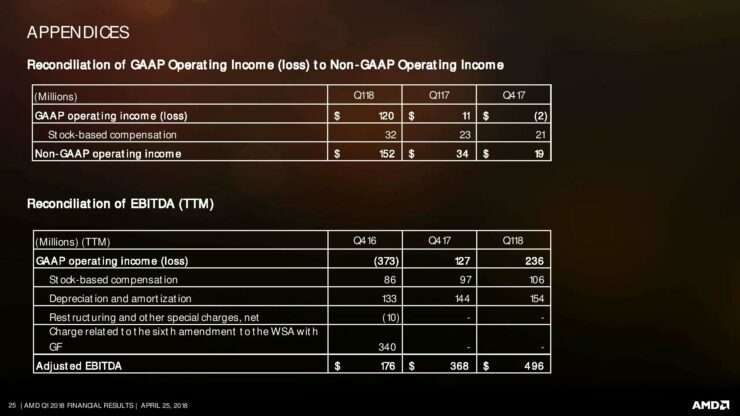 On a non-GAAP basis, operating income was $152 million, net income was $121 million, and diluted earnings per share was $0.11. The company successfully beat analyst expectations of 6 cents EPS on the dollar by 5 cents. That the company blew away conservative estimations of this quarter is an understatement. Disclaimer: I own no stock in AMD, NVIDIA, Intel or any of the related companies and have no plans to do so for the immediate future. AMD has just reported a breakout quarter and the stock is trading up 9.34% (at the time of writing) in pre-market. 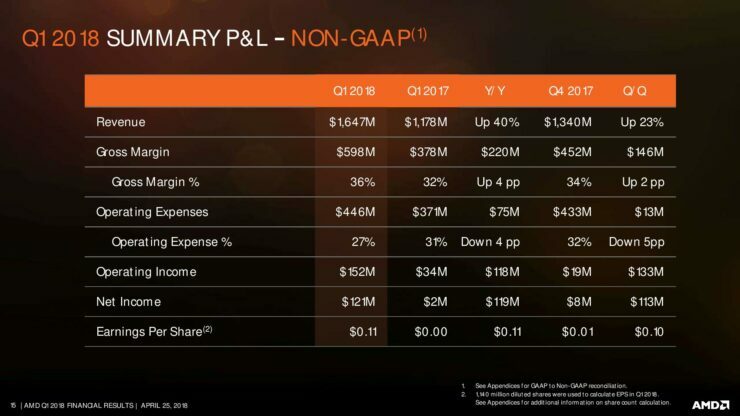 On paper, it looks like the companies efforts have finally started paying off big time and the company is firmly on the other side of the fence in terms of profitability. That said, there is more to these numbers then meets the eye. 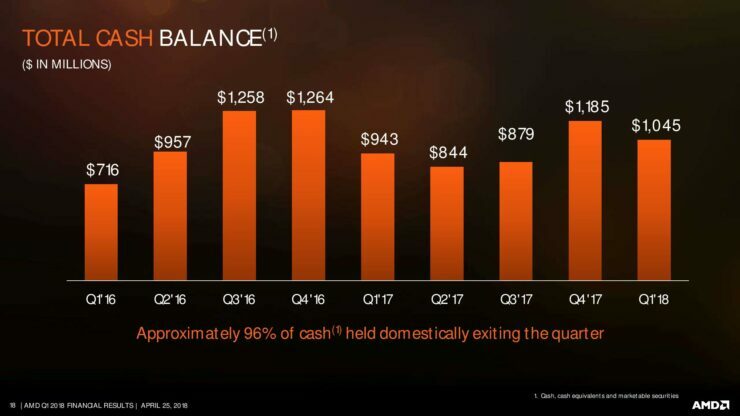 For one thing, this is the last quarter that included the full force of the cryptocurrency mining boom. Since earnings are usually a lagging indicator, we will see any adverse effects of the mining boom in next quarter results (assuming the market doesn’t rebound in that time frame). For the past couple of months, all major cryptocurrencies have dropped drastically in value and have made mining unprofitable for many of them. Couple this with the fact that Bitmain has been touting its brand new Ethereum miners to enter the market sometime this quarter and we can see why demand for GPUs might start drying up soon. 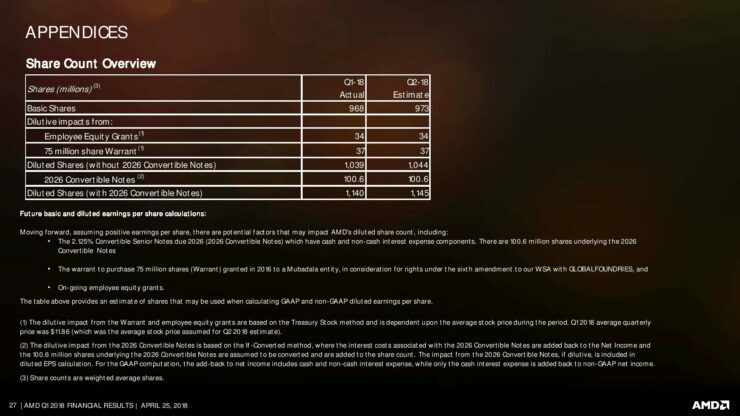 In fact, Digi Times talked to sources familiar with some Taiwan based graphics manufacturers (including MSI and Gigabyte) and reported that most AIBs expect to see a drop in demand of graphics card and a shrink in Total Available Market (TAM). During the mining boom, GPUs had been trading for 2-4x times their MSRP but if the miners start pulling out this quarter, that will be an unsustainable level to maintain. 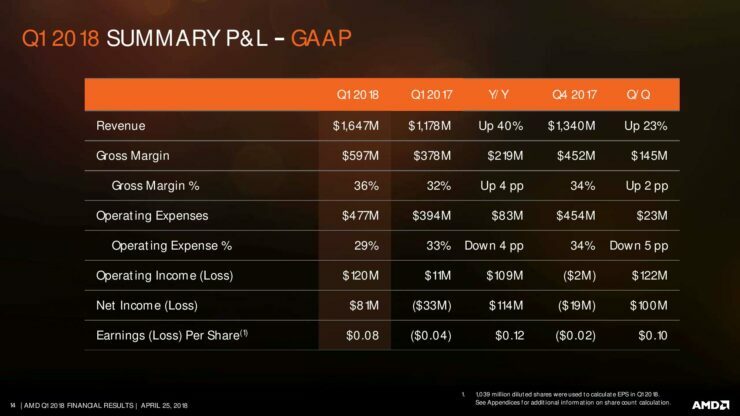 The good news is, AMD wasn’t the one completely enjoying those wide margins – AIBs and distributors were. The bad news is, they will almost certainly feel the drop in demand as it trickles up the supply chain. Another interesting point to note is the fact that the company recently adopted the ASC606 accounting standard which will have an impact on how numbers and on-paper profitability is reported. 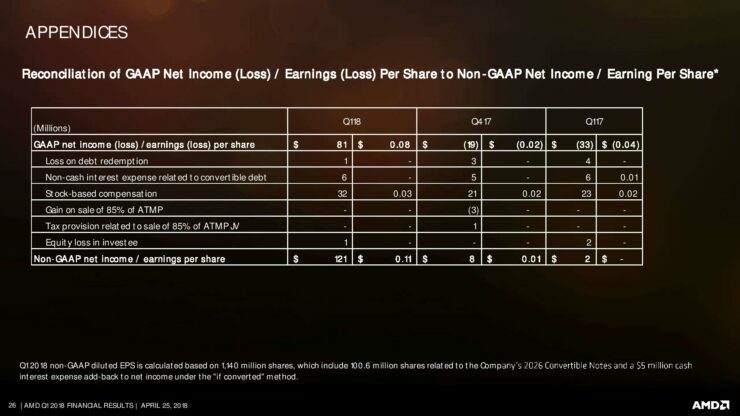 The company has revised historical numbers as well to conform to this standard so it will be prudent to revisit them and compare the impact that old earnings have taken. The impact on revenue recognition is immaterial under this new standard. Before we go on to AMD’s biggest strength lets talk about its biggest weakness – namely the Radeon side of things. Big names like Raja Koduri and Chris Hook have already left the ship and the future of the graphics side of things is as uncertain as ever. There has been talk of a Vega Nano in the pipeline but that has yet to materialize. 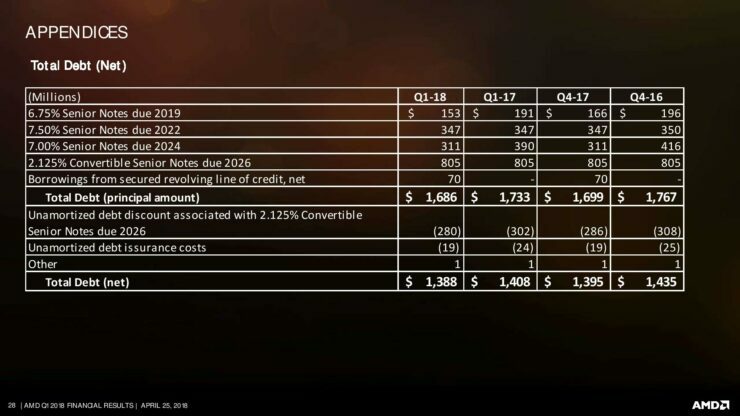 The biggest problem the company has right now is that the GCN architecture does not scale above 4096 SPs and a completely new “Next-Gen” architecture will now be required to move forward. 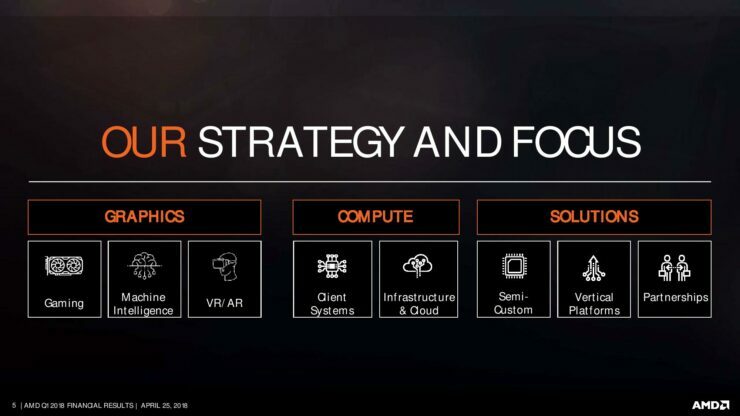 With the company focusing entirely on its CPU efforts right now, it is uncertain when that will come to pass although the company does paint a hopeful picture with its 7nm refresh roadmaps. 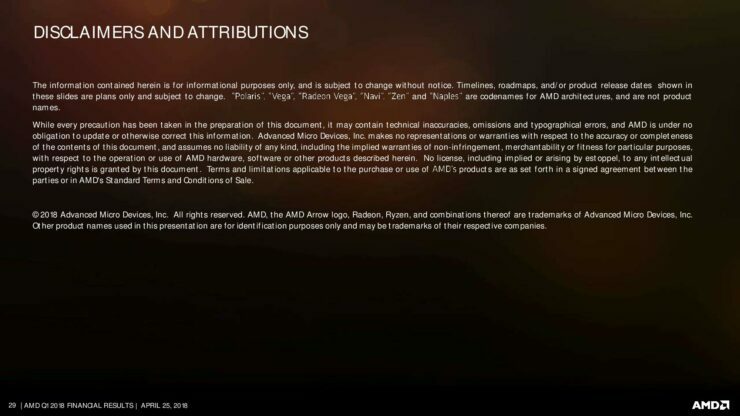 The shining beacon of hope in AMD’s ship, however, is its x86 effort. 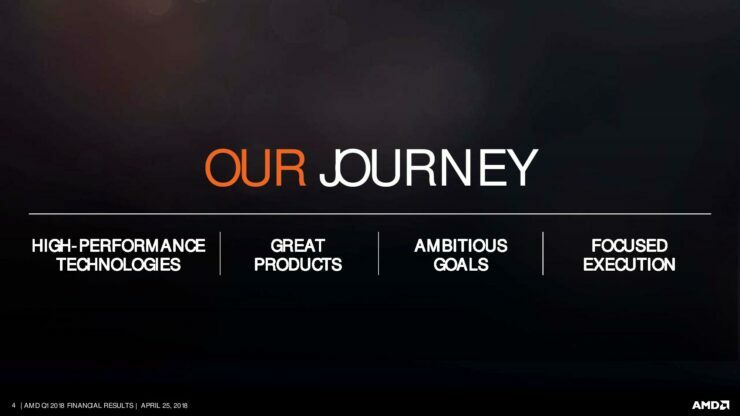 To say the company made a comeback would be the understatement of the century. From CPUs that could barely compete with generations-old Intel offerings, they now have CPUs that in some benchmarks are actually beating the competition. 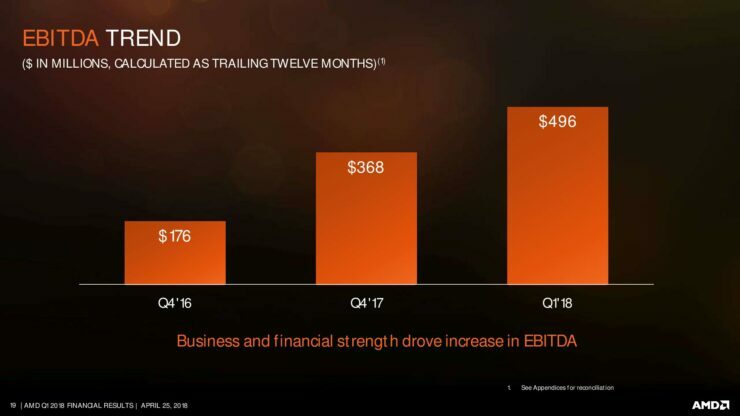 Not only that but the company is absolutely ruthlessly undercutting the price/performance positioning of Intel and from what we have heard – will continue to do so. 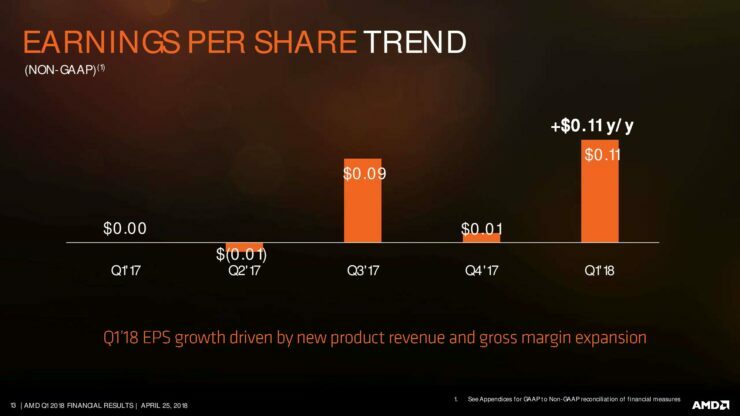 It is clear that the company is just getting started with its CPU side of things and we can expect more products to come our way. 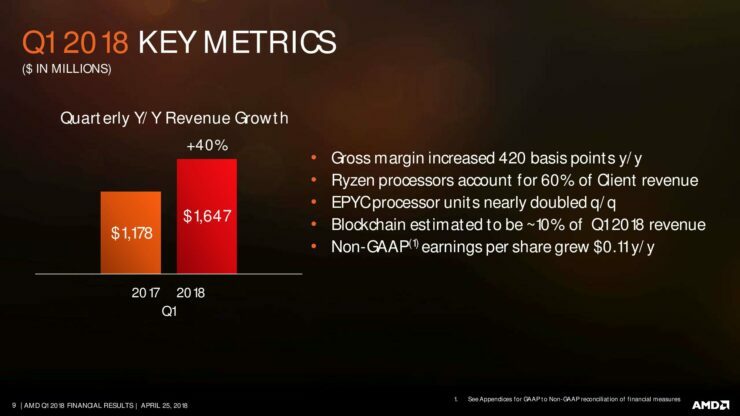 AMD’s story, ironically has always been like this, a few years ago, it was the CPU side that was lacking with an incredibly strong Radeon division and now, it looks like its the exact opposite. 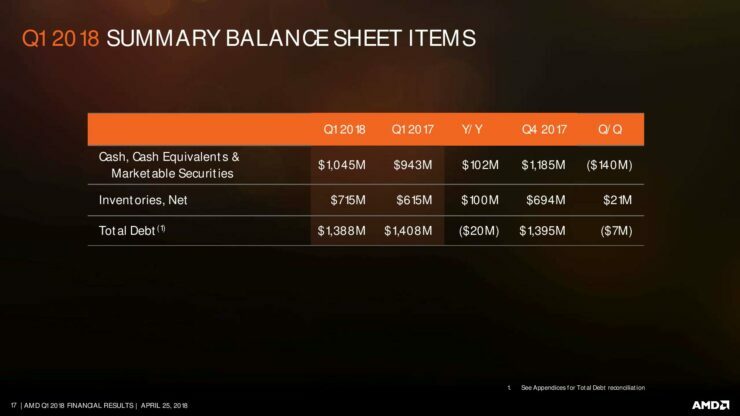 Its worth mentioning that Radeon RX Vega GPUs remain extremely lucrative for mining purposes. 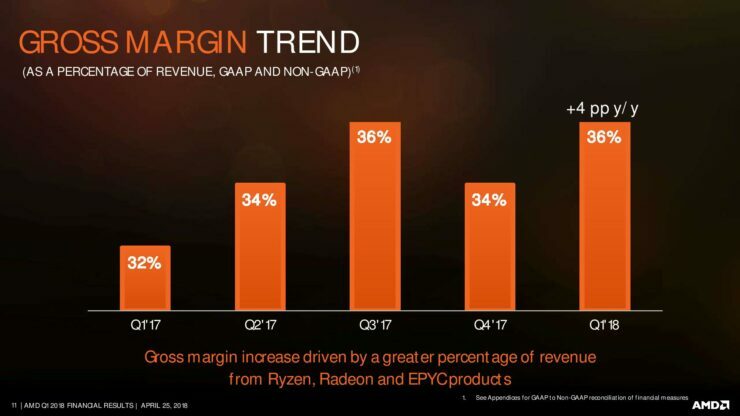 Client processor average selling price (ASP) increased year-over-year and quarter-over-quarter due to a greater percentage of revenue from our Ryzen products. GPU ASP increased year-over-year and quarter-over-quarter driven by a greater percentage of revenue from our new Radeon products. Operating income was $138 million, compared to an operating loss of $21 million a year ago and operating income of $33 million in the prior quarter. 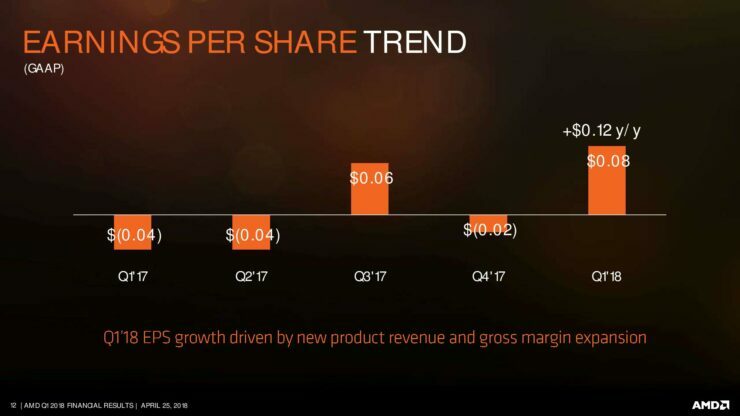 Operating income improvement was driven by higher revenue. 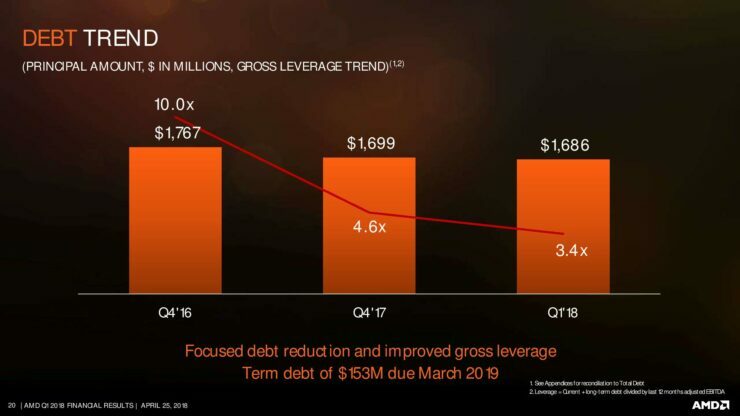 Operating income was $14 million, compared to operating income of $55 million a year ago and an operating loss of $13 million in the prior quarter. The year-over-year decrease was primarily due to a licensing gain that occurred in Q1 2017. 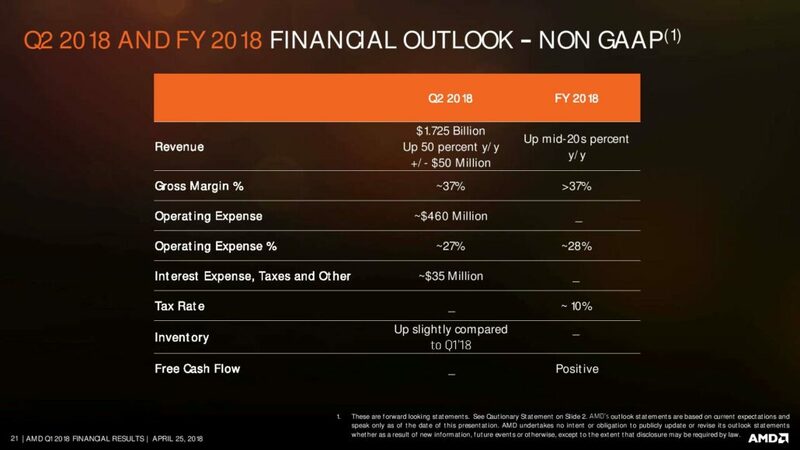 The quarter-over-quarter increase was primarily due to higher revenue. 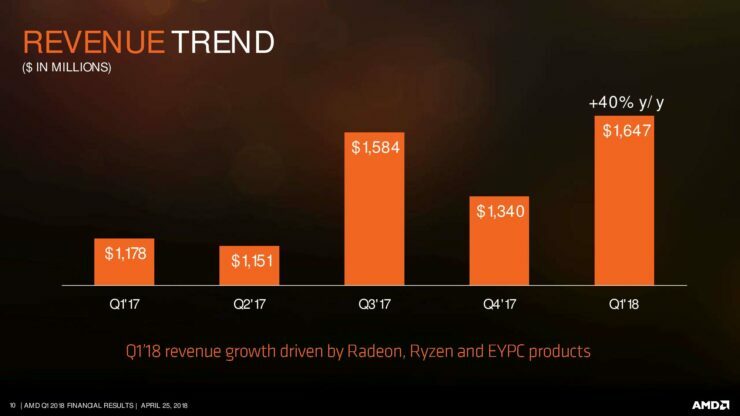 AMD introduced the first AMD Ryzen desktop APUs, combining the high-performance Radeon “Vega” graphics architecture with revolutionary “Zen” CPU cores on a single chip. 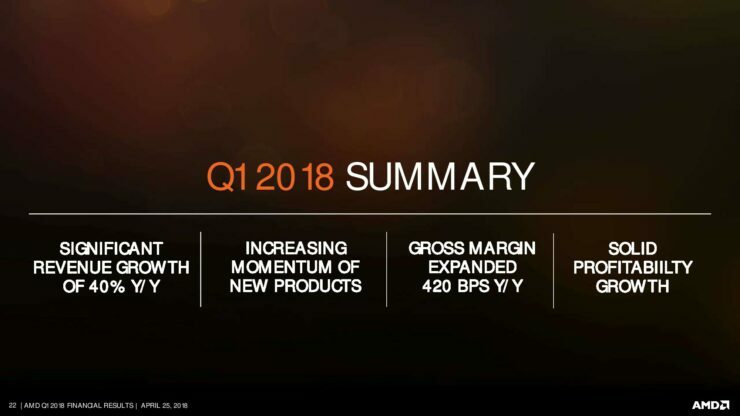 AMD also delivered the next products in the Company’s strong multi-generational roadmap with the launch of its 2nd Generation Ryzen desktop CPUs just over one year after bringing the first Ryzen processors to market. 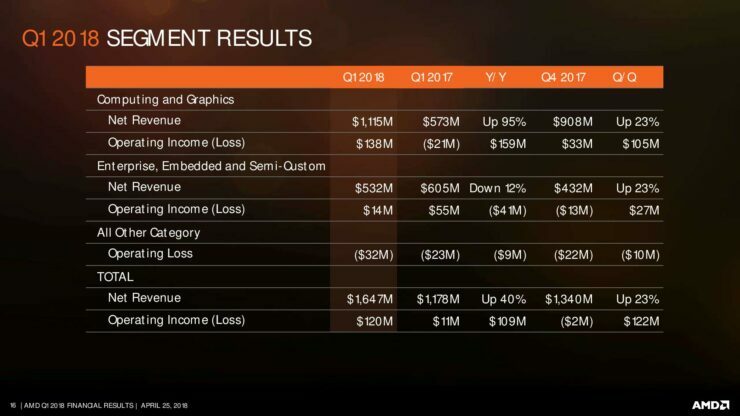 The new 2nd Generation Ryzen processors can deliver up to 15% higher gaming performance compared to 1st Generation Ryzen processors, with the Ryzen 7 2700X processor delivering the highest multiprocessing performance available on a mainstream desktop PC. Dell EMC introduced three new PowerEdge platforms powered by AMD EPYC 7000 series server processors. Yahoo Japan Corporation and Packet joined the expanding list of global businesses deploying EPYC processors to enhance the performance and efficiency of their datacenters. 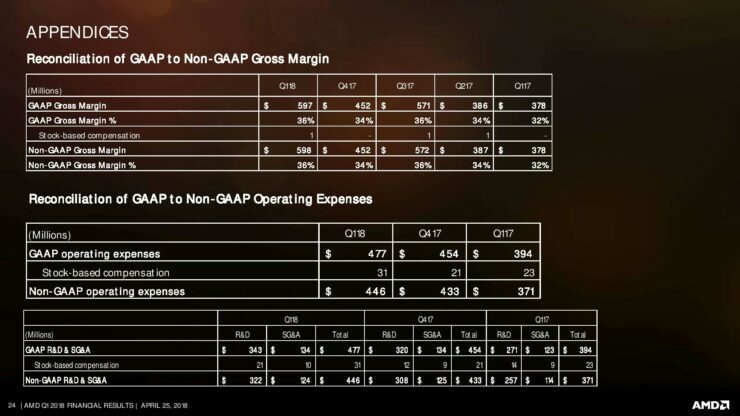 and non-GAAP gross margin of approximately 37 percent.